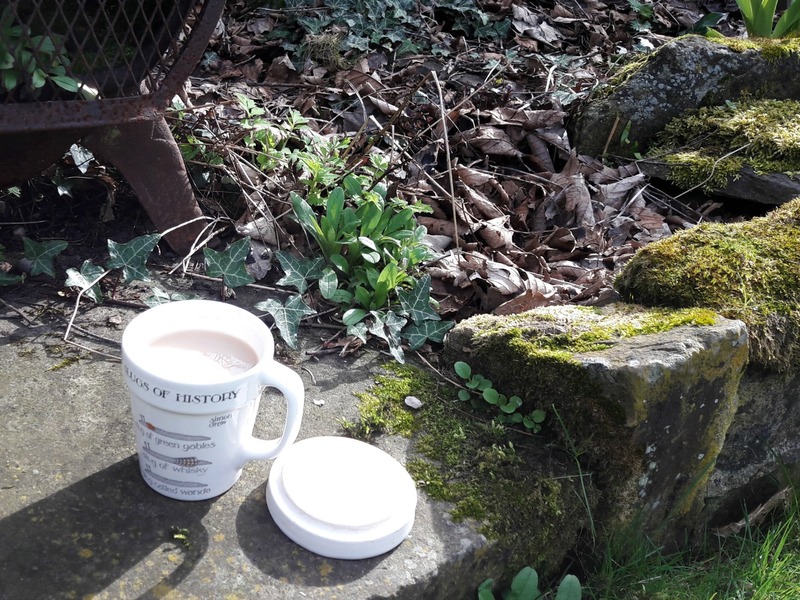 Whilst other parts of the world were knee-deep in unexpected snow thanks to Storm Stella, it was a beautiful day in Winwick last Wednesday so I made the most of it and spent it in the garden. Our poor garden - it's still recovering from the winter and despite the abundance of snowdrops and daffodils, has that scruffy, dishevelled look that gardens have until the new leaves properly start to appear on the plants. 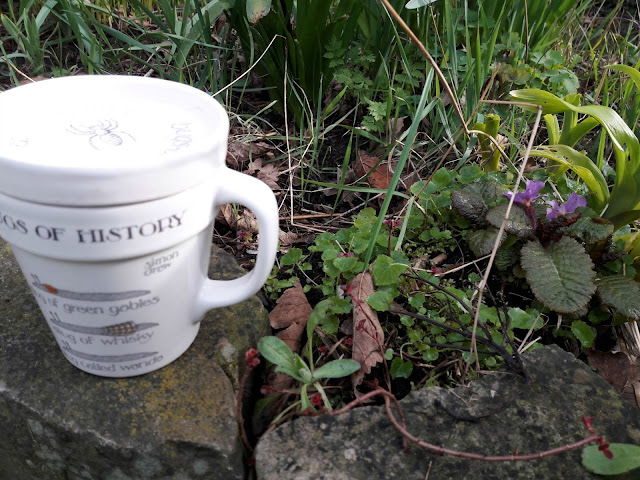 Armed with a brew in my trusty "Famous Slugs of History" anti-bug mug, I headed out to continue the clearing up operation that I've been doing since the autumn. Strong winds and relentless rain over the winter has made such a mess; it's great being surrounded by trees until you realise that also means a garden full of leaves and twigs which need sweeping up. Where do they all come from? I've been sweeping up leaves and twigs since September! I really need to do something about our grass this year too; the ground isn't as free-draining as I'd like it to be and being shadowed by the trees isn't the best condition for grass to thrive. We've got a lot of moss growing in amongst the grass now and I need to put lawn sand down to kill it off and then rake it all up. I think I'm going to try sowing white clover instead of more grass seed - apparently it's more hardy than grass, always looks green and the bees like the flowers. Oh, and it doesn't go brown when the dog piddles on it either like grass does which has got to be a huge bonus. Has anybody tried it? Did it work for you? I'm delighted to see the poppies are growing again. They have such lovely serrated leaves and the contrast in the green of the poppies in the foreground and the Crocosmia behind is just lovely. 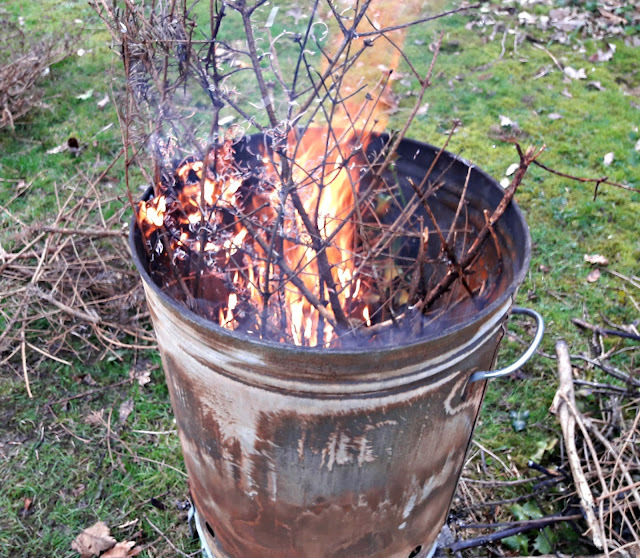 It's not proper gardening for me these days unless I've got a bonfire going. It was such a beautiful day, sunny and without any wind for a change, that the fire was easy to start and I soon got rid of a huge pile of twigs and small branches that I'd collected up which weren't suitable for the green waste bin. The downside of a bonfire is that I go back into the house smelling like a kipper, but it's always worth it! Finally, a job I'd been putting off for too long. 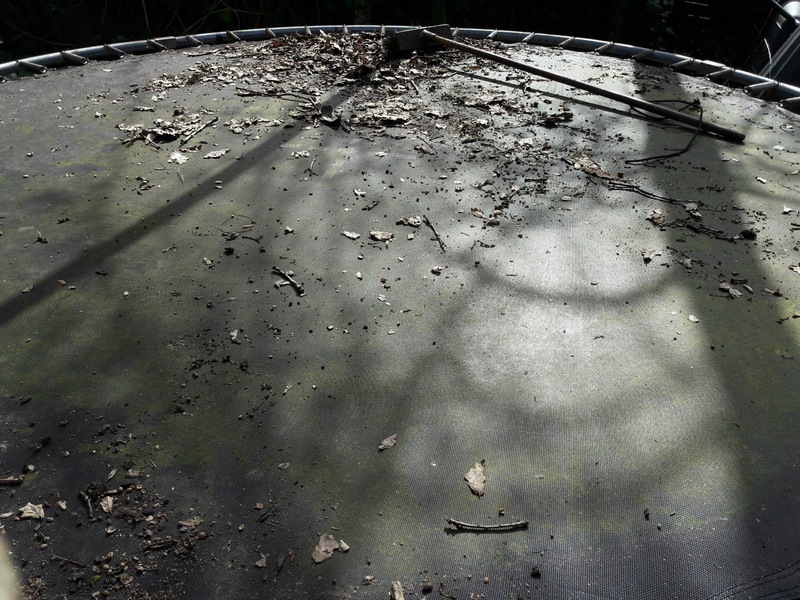 Our trampoline was looking more than a little bit of a mess, covered in leaves, twigs (no surprises there) and that green whatever-it-is - mould, lichen? - that comes from being underneath trees. The safety padding over the springs had disintegrated and the safety net had long since been shredded by the dog. If you ever saw the John Lewis Christmas advert with the trampolining dog ... then our dog was nothing like that. No perfect bouncing in the middle of the trampoline, no joyful leaping higher and higher with a doggy smile on his face and definitely no synchronised boinging with small daughter or any other furry animals. Oh no. Our dog liked to fling himself against the safety netting, catapulting himself from one side to the other like some sort of canine cannonball until the net gave up the ghost and we were seriously worried that he would ping himself over into next door's garden (luckily, he never did). I don't even remember how he started getting himself up there; watching the girls no doubt and not wanting to be left out. Perhaps we should have replaced the net, but without it, the dog wasn't interested in the trampoline and small daughter learnt to take more care so that she didn't fall off the edge. It's nice that she still wants to use it, with high school looming on the horizon, but she does so with the nicer weather on it's way it was time to clean it up. A good brush, a scrub with some all-purpose cleaner, new safety padding and we're good to go again. Oh look. Time for another break. 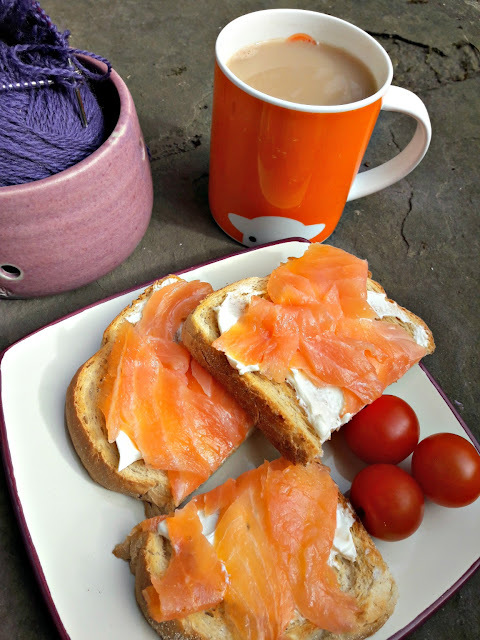 Late lunch this time - is there anything nicer than smoked salmon and cream cheese on toast with a bit of knitting in the sunshine? Only knowing that your dog is sitting next to you, drooling at the thought of crumbs, and with all paws safely on the ground. ha ha ha had mad images of your dog 'pinging & bouncing' around the netted trampoline, in cartoon style! all those leaves & twigs you should make a compost pile, then you will have some lovely soil to use once it's composted. i do like a good bonfire too! 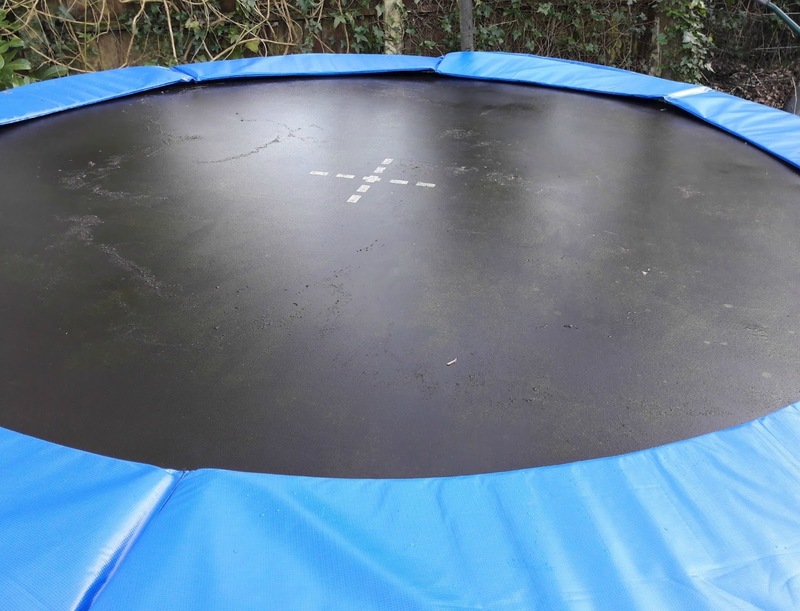 Wow, the trampoline scrubbed up well! 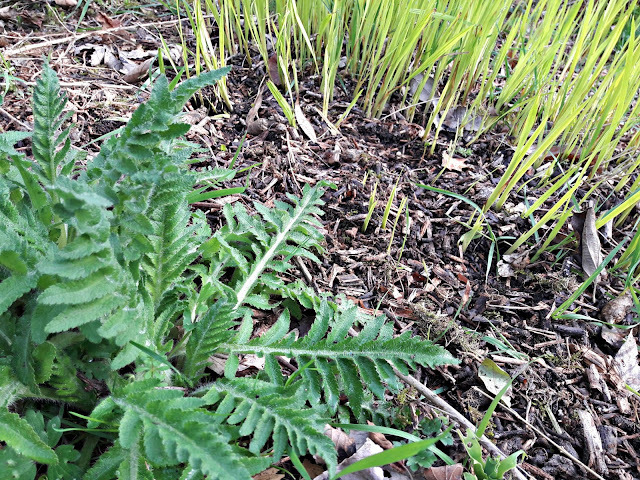 It is so lovely to get out in the garden again and every day there seem to be new shoots emerging. I had never heard of the white clover before but sounds like a great solution. It would look so pretty too. The first day of spring today, I hope you have better weather than we do here, its bucketing it down, not at all springlike. Your trampline scrubbed up wonderfully. Great mug! 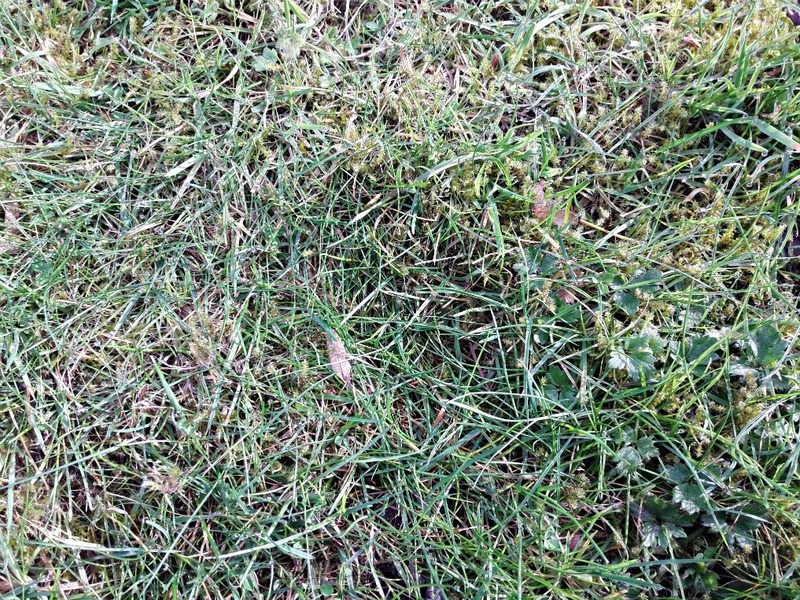 I'm trying to encourage the clover in my yard as well. I keep thinking about sowing more clover seeds but never seem to get around to it before it gets too hot! Still, the clover I have does very well, and it's gradually spreading on its own. It's hardy and green, the flowers are pretty, and when it gets thick it does block out the weeds. We don't have issues with moss here, so I can't speak to that part. 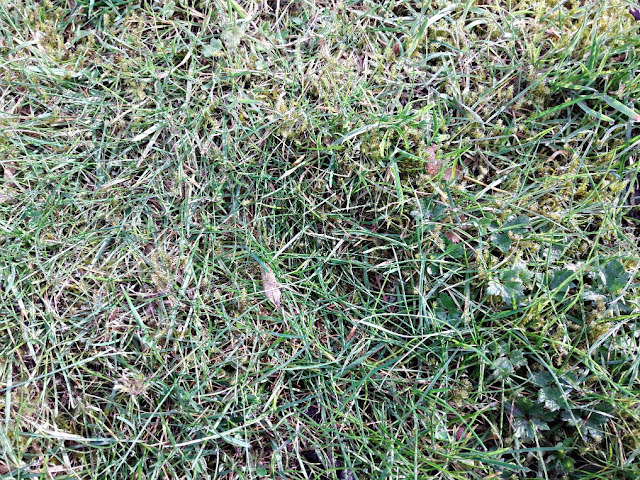 The only troublesome thing about clover is that it does attract bees, and if you have small children or anyone else who likes to sit on the "grass," that can be a problem. The solution is relatively simple -- mow off the flowers -- but they're pretty and I don't like to mow that often anyway.